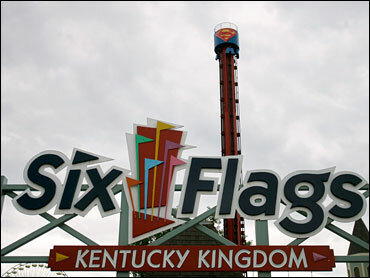 A couple whose teenage daughter had her feet severed on a Six Flags Kentucky Kingdom ride sued the park on Thursday, saying it was negligent in maintaining and operating the ride. The lawsuit, which also alleges negligence in inspecting and testing the ride, asks for a temporary injunction to prevent the park from altering or destroying the ride and a cable that investigators believe cut off the girl's feet. Randall and Monique Lasitter, of Louisville, filed the lawsuit on behalf of 13-year-old Kaitlyn Lasitter, who remained hospitalized Thursday in good condition at Vanderbilt University Medical Center in Nashville, Tenn., The Courier-Journal reported. The lawsuit seeks unspecified damages. It claims that Kaitlyn has suffered permanent injury and severe emotional pain and that her ability to earn money has been impaired. Doctors at Vanderbilt reattached Kaitlyn's right foot after the June 21 accident but couldn't save the left. Carolyn McLean, a spokeswoman for the theme park, declined comment Thursday night and said she hadn't seen the lawsuit. The Lasitters said through a Vanderbilt spokesman that they had no comment.